A relief map uses shading and coloring techniques to depict terrain elevations and depressions. 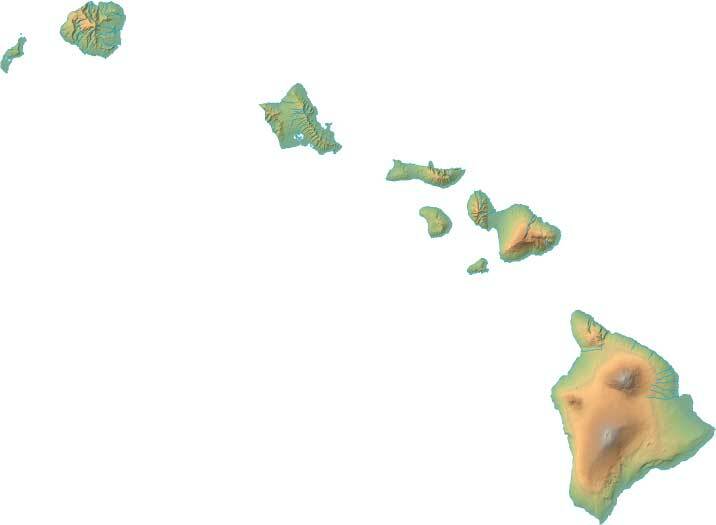 This Hawaii map page features static and interactive relief maps of Hawaii that depict mountains, valleys, and other physical features. The static map shows terrain features within the boundaries of the state, while the interactive maps can be zoomed and panned to show detailed terrain features and contour lines in Hawaii and the surrounding region. The interactive relief map choices include a standard Google terrain map and an enhanced Google terrain map with Street View capabilities. To zoom in or out on either of these Hawaii maps, click or touch its plus (+) button or its minus (-) button, respectively. To pan either map in any direction, simply swipe it or drag it in that direction. To display either of these Hawaii terrain maps, click or touch one of the following menu options. Hawaii's highest mountain is Mauna Kea, whose peak is 13,796 feet above sea level. Other notable mountains in Hawaii include Mauna Loa (13,680 feet) and Haleakala Crater (10,025 feet). If you are planning a visit to Hawaii, please see Go Hawaii, the official state tourism site, where you can find a wide range of travel and vacation information. For information about Hawaii history and recreational activities, visit the following National Park sites.